Black Americana is a difficult area of advertising to address in many cases. Many advertising campaigns or products used racist characterizations or stereotypes to try to promote their products. These uncomfortable references to another time in American history are important to preserve because forgetting the past only dooms us to ignorance. Black Americana has a primary market in museum and display purposes for educational use about American history. There are also private collectors of Black Americana, but it isn’t a large group compared to many other collecting areas. 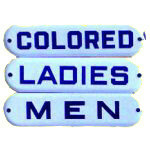 Black Americana includes a wide variety of antiques and artifacts from various products marketed to whites, to things African Americans produced for themselves and a wide spectrum of items in between. As a result prices vary widely depending on the specific item, it’s own collecting base and condition. If you have an object of Black Americana and need help establishing the value of it please don’t hesitate to contact us for help.